Lovejoy is an upperclassmen housing facility, built in 1952 and dedicated in 1954, that houses both freshmen and some upper-year students. The total occupancy of Lovejoy is 163 students, with a combination of singles and doubles available. This hall features floor lounges and kitchenettes to support floor activities. It also offers a large laundry/vending area and study area as well. To learn about the hall’s overall layout, see the Lovejoy Floor Plan (PDF) and Handbook for Upper Class Quad Area. 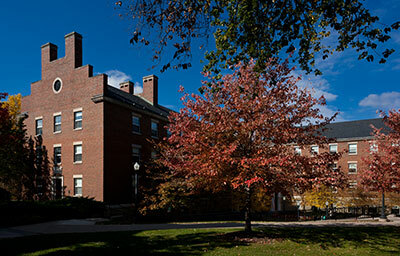 It was named after Frank W. Lovejoy, 1871–1945, member of the Board of Trustees from 1926 until his death. He was also the President of Eastman Kodak Company between 1934 and 1941.